I met Philip Kerr thanks to that great matchmaker, the fellow who (as much as anyone I know) brings writers together, and also introduces them to readers: BookPeople’s own Scott Montgomery. It was at the store, Phil was doing a reading and a signing, and afterward Scott introduced us and invited me to join the two of them at dinner. Immediately, Phil and I hit it off, and I was thrilled because he was, and still is, one of my favorite writers. (When Philip died this week, the personal loss was compounded by the knowledge that I will have just one more Bernie Gunther book, the one just published, left to read.) That friendship is why, I’m sure, Scott asked me to write a little about Phil to mark his passing, to honor our mutual friend. But I want to start not by talking about the man, but about his Bernie Gunther books, to linger on those for a moment. Why? Because they are Phil’s legacy, wonderful gifts of brilliant story-telling and if you’ve not read them, I want to explain why you should (and if you have, you’ll be nodding along in agreement). They are all about the man, Bernie Gunther. He’s a policeman in Berlin, and the books are set in and around the Second World War. Sounds pretty grim, right? But that was part of Phil’s genius, taking one of the darkest times in human history and infusing them with the wit, charm, and sometimes-disguised morality of his detective. Bernie himself is no angel, that’s always made clear—he drinks and smokes and chases women. He’s not afraid to pull the trigger, either, but he only does so when necessary and in the search for justice for some poor murder victim, or to save his own skin from someone infinitely more callous, someone genuinely wicked. In my opinion, and I’ve only been reading crime fiction for forty years, so what the hell do I know, Bernie Gunther is one of the most compelling characters ever in the genre. Phil’s books are more than just adventures for Bernie, though, they are also phenomenal explorations of history. Every book will teach you something new about the period in which it is set, and each time it’s a delightful learning experience, a revelation of fascinating sub-stories, not a dry info dump or a preachy pedagogical exercise. Always filled with characters from the era that we recognize, so many bad Germans, who are complemented by colorful characters created by the devious, mischievous mind of Philip B. Kerr. And reading them you will travel to places like Germany, France, Russia, and Argentina. I’ll try. The first time I saw him was that reading at BookPeople, and I call it a reading not because he read from his new book but because he literally read his talk to the audience. I thought that odd, he was so charming and funny it was hard for me to understand why he needed to read his presentation. Afterward, we talked about the touring he has to do for each book, and he admitted that he was an introvert and didn’t always enjoy public appearances. He found them challenging sometimes, I think, for the added reason that he was almost always the smartest man in the room (his law degree was topped off with post-graduate studies in German law and philosophy) and he had an inability to suffer fools (at all, let alone gladly). As a relatively new author myself, and certainly not anywhere near Phil’s level of success, I was momentarily taken aback at his raw honesty. But that’s what it was, honesty. And, for the record, he was right. I, too, have endured pointers to alleged mistakes and, even though the person challenging me was wrong (you can buy strawberries in the Pyrénées mountains in winter! ), I was still polite and even mildly apologetic. But not Philip Kerr. He didn’t need to pander to an audience member asking what he thought was a silly question. He was honest enough to say what many of us might have thought, but probably wouldn’t say. But don’t think he wasn’t kind. He was. I’ve told this story many times, and I’ll tell it again because it shows what kind of person he was. He was talking about the publisher-arranged drivers who ferry him from the airport to the hotel and to the book events. This quiet, brilliant, introvert told me that should I ever be the writer being picked up by a volunteer, I should always sit in the front passenger seat and never the back seat. If someone is giving you their time because they love your books, don’t you dare treat them like a hired taxi driver. This from the man who, I am convinced, would every time liked to have sunk into the back seat with his thoughts to enjoy some peace and quiet. I am so sad that I won’t get more advice from him, and that there will be an end to the Bernie Gunther books. I am angry, even, that I didn’t get to say good bye and that we won’t have one more drink at the Four Seasons bar and comment inappropriately about half of the people in the room. As a prosecutor, my humor is blacker than most people’s but Phil was one person I could share it with, without shame or reticence. Yes, I am both sad and angry, but I am also grateful. Grateful for his books that have given me so much pleasure, that have inspired me to be a better writer myself. But also for those moments of quiet amusement we shared. The sushi and beer we consumed on South Congress, the car rally we enjoyed that same night. The twinkle in his eye when I handed him an AR-15 with laser scopes at a range south of Austin. His gentle laughter when I choked down some oysters at his favorite restaurant in London. His stories of meeting Tom Hanks and drinking with Gerard Depardieu. That was the thing about Philip Kerr, he knew how to tell a story, be it over 300 pages of a book, or over a gin and tonic in the pub. It was his gift. There was one story we wanted to share together—it was an idea for a TV show, one that excited us both for a while, based right here in Austin. Charlie Sector, it was to be called. A cop show that we both threw ideas at, and he wrote a treatment for. It didn’t get off the ground but that didn’t stop us talking about it every time we saw each other. There’s always so much left undone, isn’t there? So much left to do. I’ll miss you, Phil, but thanks. Thanks for everything. Mark Pryor’s latest novel is Dominic. 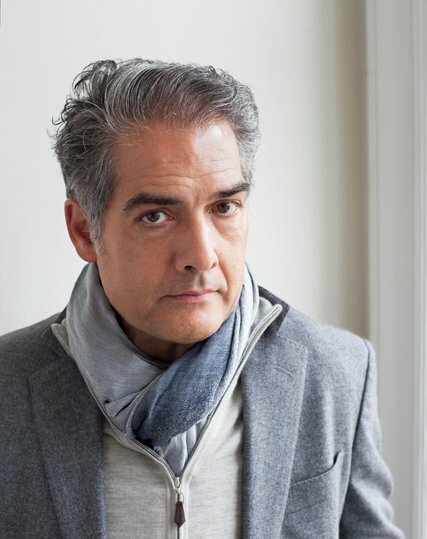 Philip Kerr comes to BookPeople to speak and sign his latest Bernie Gunther novel, Prussian Blue, on Saturday, April 8th at 6 PM. You can find copies of Prussian Blue on our shelves and via bookpeople.com. 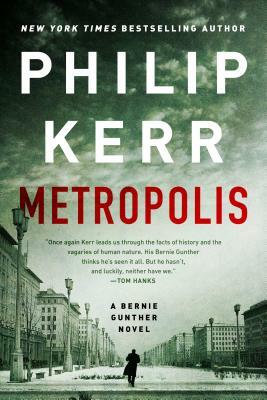 Philip Kerr has always excelled at highlighting the small crimes within the large crime, usually through his character Bernie Gunther’s quixotic attempts to help bring justice to individuals under the governance of the Third Reich. Despite acting under the orders of a high-ranking Nazi, Gunther gets called in to work when the Nazi leadership is in need of a professional detective to solve a crime, rather than assigning blame to a convenient scapegoat. Gunther, in each of Kerr’s works, gets his kicks and preserves his own safety by pitting Nazis against one another or in later settings, playing every side of the Cold War. The nominations for the 2016 Edgar Awards were announced last week. This seemed to be the year where great minds think alike – many of the nominees made in on to our best of 2015 lists, put together by Scott and Molly. We want to congratulate old friends and new favorites, including Duane Swierczynski, nominated for his novel Canary, David C. Taylor, for Night Life, Michael Robotham, for Life or Death, Megan Abbott, for her short story “The Little Men,” Philip Kerr, for The Lady From Zagreb, Lou Berney, for The Long and Faraway Gone, Lori Rader Day, for Little Pretty Things, David Joy, for Where All Light Tends To Go, Gordon McAlpine, for The Woman with the Blue Pencil, Jessica Knoll, for Luckiest Girl Alive, and Adrian McKinty, for Gun Street Girl. Congratulations all the others who made it. Best of luck to everyone and have a great time in New York. Click here for the full list of Edgar Nominees.